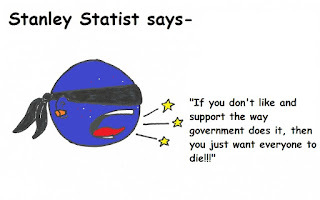 Statists love false "either/or" scenarios. Either you agree to their beloved police state tactics, or obviously you just advocate chaos, death, and destruction. I actually have an example from a few days ago. In response to my post against checkpoints (on G+), some Comrade Kapitalism guy actually claimed that since I was against checkpoints (which he claimed are not intrusive and are effective at protecting people from drunk drivers), then I was against ALL safety measures. Yes, ALL of them. So I told him about a safety measure that could actually work without violating everyone's rights, and he said that (under the current situation) it's too expensive. Government extremists want it both ways. If you don't go along with what they want, then you want "nothing" to be done. Just like if you don't want people robbed to finance libraries, you hate libraries. If you show that they are wrong, they'll just find another thing to whine about. They are nimble whiners. Cowards, lazy non-thinkers, and ethical cripples. 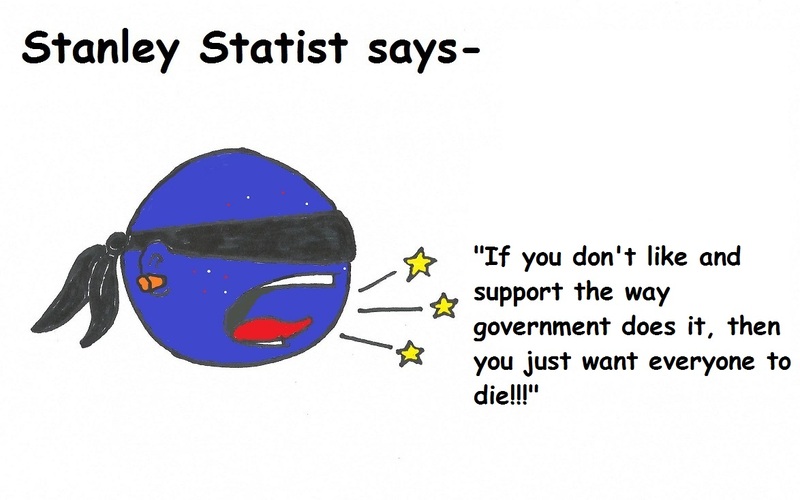 It's what makes a statist a statist.